Leading Manufacturer of rope pulley, double type wire rope pulley, plastic pulley, triple sheave pulley block, fitness pulley and cable carrier pulley from Ambala. Available product capacity 1/2 Ton, 1 Ton, 2 Ton, 3 Ton, 5 Ton, sold individually, and orders any quantity for your project as per your requirement. In line with clients' diverse requirements across the country, we are offering an excellent range of Double Type Wire Rope Pulley. 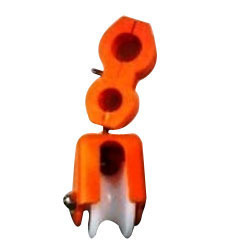 The offered pulley is mainly used in lifting blocks for precise applications. Being a quality-oriented organization, we assure our clients that this pulley is excellent on counts of durability and quality. 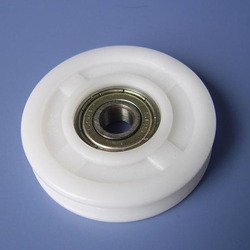 Being a customer oriented firm, we are engaged in offering optimum quality Plastic Pulley. 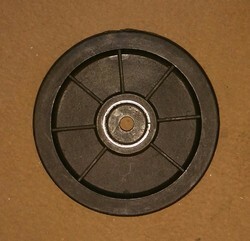 Being a customer oriented firm, we are engaged in offering optimum quality Cable Carrier Pulley. Besides being manufactured from high-grade raw material and latest technology, the offered range is inspected properly by our expert professionals.